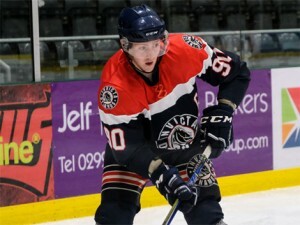 Club captain Bobby Chamberlain claimed his first ever goal for the Invicta Dynamos on Sunday night as he notched just 9 seconds into sudden death overtime to help his side defeat the Swindon Wildcats 3-2 and complete a 4 point weekend. Having overcome the Cardiff Fire on the road the night before, the Mos were in good spirits but up against it as they played host to former EPL outfit and league newcomers the Swindon Wildcats. Determined to make their mark, they started well – both Ondrej Zosiak and Tommy Ralph testing the reflexes of netminder Renny Marr with shots through traffic from the blue line that the goalie was equal to. Down the other end Sam Bullas threatened to break through with some neat stick work but Zosiak sent him sprawling with a hefty hit just as he neared the target. Floyd Taylor was next to come close but, having been found point blank right, he was unable to force beyond a stubborn John Dibble – in for his first outing of the new season. At 12.44 the stalemate was broken – from back on the edge of the offensive zone import Zosiak sent a wrist shot through bodies and high over the shoulder of Marr into the top far corner to make it 1-0. Tempers then threatened to flare as Max Birbraer hit Callum Fowler moments after the whistle and this eventually resulted in a wrestling match between the Wildcats’ import and Bobby Chamberlain who rushed in for a brief tussle. When play restarted Marr did well to prevent Louis Colvin’s goal-bound poke finding twine after a cross ice pass from Fowler before Swindon then finished the frame strongly. Dibble denied Luc Johnson close left and then Joseph Hazeldine’s long drive but was eventually beaten at 19.35 – an EPL standard move between Johnson, Jan Kostal and Sam Zajac ended with Zajac roofing over the netminder’s shoulder from the slot to tie it up at 1-1. In the second period Swindon had the rubber in the net after just 61 seconds but referee Blaine Evans washed it out with the puck adjudged to have crossed the line after the whistle. Undeterred, Aaron Nell tried his luck with an effort from close left that looked certain to find the top far corner but John Dibble made a timely glove save. The shot stopper then blocked Ben Nethersell’s long drive and readjusted quickly to rob Nell’s rebound tap-in at point blank range. Perhaps Swindon’s biggest chance came when Tommy Ralph lost possession to Phil Hill along the left boards allowing him to feed an unmarked Max Birbraer alone in the slot but his one-timer was off target with the goal at his mercy. A frustrating night for Nell then took a turn for the worse when he was then on the receiving end of a thumping hit from Arran Strawson but still the Wildcats pushed forward – eventually reaping the rewards at 35.47. A Sam Bullas pass to the crease set up a frenzied scramble during which Nethersell fired home to put the visitors 2-1 up. The final period began with Swindon still on the front foot and Chris Jones had a big chance when he jumped on a wayward clearance to go clean through but John Dibble saved to keep his side within one. Down the other end Adam Rehak looked to have scored when he was found at the back post with an inviting cross-ice pass but his one-timer was just millimetres over the crossbar. Wildcats goalie Renny Marr had a busier third period and he was on top form to deny Bobby Chamberlain wide left, Mason Webster close right and Ondrej Zosiak from the blue line all in the space of 10 seconds. The Mos were struggling to find a goal though and their cause took a knock midway through, when Webster was sent to the box for holding, however Swindon’s powerplay was unable to beat Dibble for the two goal cushion. Just seconds after the penalty was killed the hosts then levelled the tie – a fluid counter seeing Scott Bailey and Callum Fowler exchange passes twice before Fowler steered beyond Marr at the second attempt to make it 2-2. From this point on the hosts looked the more likely to win it – a Fowler blue line shot needing a late leg save from Swindon’s unsighted netminder to turn it wide and Marr doing equally well to deny Chamberlain who fired high on the backhand after a Joshua Condren flick had put him clear. This meant the clock hit 60 with the teams tied at 2-2 and the SilverBlades set to play host to sudden death overtime for the first time in the NIHL South Division 1. Bobby Chamberlain, Callum Fowler and Ondrej Zosiak lined up for the Mos in an overtime frame that had a maximum length of 5 minutes but Chamberlain notched within just 9 seconds to claim his first Dynamos goal with a strike worthy of winning any encounter. From his own blue line the captain flew down the left channel, beat two men to move in on goal and then dispatching beyond Renny Marr with a backhand flick that sent the SilverBlades wild. So it was a huge confidence boosting 3-2 victory for the Dynamos who put in an exhausting display to match-up to their former EPL opponents and complete a 4 point weekend. The Mos stayed in the game when they had to, then made their chances count when they could to record a memorable night at the SilverBlades. Man of the match honours went to Luc Johnson of Swindon whilst John Dibble deserved a year’s supply of beers having saved 56 of 58 attempts on his net.